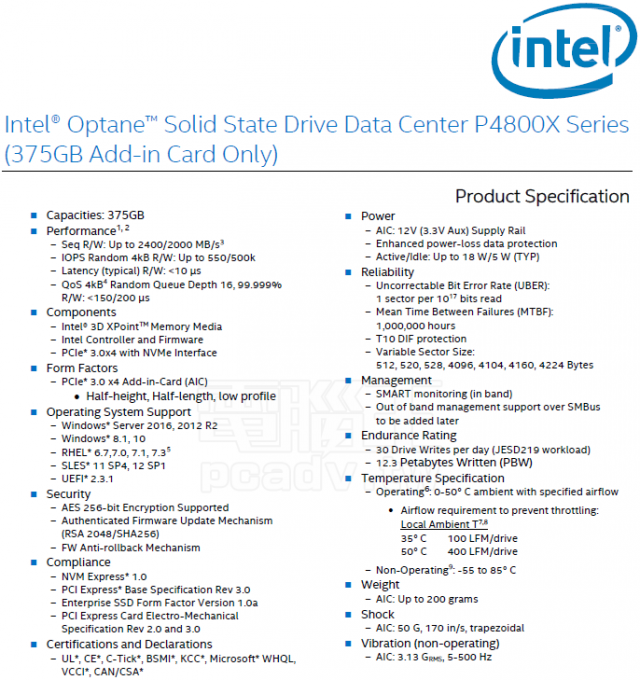 Leaks from Chinese sources point to extreme specifications for the upcoming Optane P4800X including a reading/writing latency as low as 1.5 ms. In addition to existing leaks, Intel's official website has been teasing a potential new SSD called the DC P4500 Cliffdale. The datasheet suggests that the chipmaker has been developing the SSD in conjunction with Kaby Lake CPUs. Currently, however, the high price of 3D XPoint technology has been limiting such high-performance SSDs to servers and enterprises instead of consumer electronics. It remains to be seen what market or markets the rumored SSD will cater to. The drives utilize the standard PCIe 3.0 x4 interface with a maximum read/write rate of 2400 MB/s via NVMe. Additionally, the DC P4800X will be rated for up to 30 Drive Writes Per Day (DWPD) meaning that its entire capacity can be wiped and overwritten 30 times a day and still be covered by the manufacturer warranty. In comparison, most existing SSDs are covered for up to 10 DWPD only. The new drive should be able to write up to 12 petabytes during the course of its lifetime. Other new standards include reduced read/write latencies at just 1.5/2 ms. In comparison, Intel's current DC P3520 SSD offers a read/write latency of 130/50 ms. If the datasheet is true, then the upcoming generation of Intel SSDs should be one of the fastest available. Intel's preliminary plans to apply 3D XPoint to RAM could potentially usher in a new generation of memory as well.